This stall is famous for its Chicken rice and has increasingly expanded to stirred fried dishes such as hot plate, clay pot dishes. 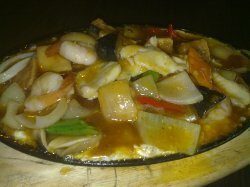 This hot plate tofu dish though generous in its serving and ingredients, it is too oily. The starting price of this hot plate tofu dish is $10 (small) and so on. The dish is served piping hot and my favourite part of the dish is perhaps the layer of egg laid on top of the surface of the hot plate. However, for its price and taste, I would not recommend this dish for first time goers.